By Wojtek Wieczorek, Humanities student at Amsterdam University College. 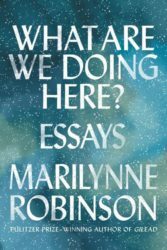 It is often distinctly difficult to follow Marilynne Robinson’s line of reasoning in her newest collection of essays What Are We Doing Here? When a careful reader pays full attention to her elaborated analyses of, for instance, the maladies of the American education system or developments in the history of Puritanism, she unexpectedly digresses from the central thought and remarks upon matters seemingly unrelated. Not many lines later, the same reader is struck and enlightened by the exact words which felt unfamiliar. It comes as no surprise that writing about issues such as beauty, conscience or modern democracy requires raising a remarkably wide range of subjects. In doing so, she submerges us in her intellectual, spiritual as well as everyday world, which we finally leave far more knowledgeable and sensitive. Robinson’s name is mentioned in numerous debates on various topics; she is the voice of reason when ideas and values are at stake. She gained initial recognition with her novels – for which she received the Pulitzer Prize (2005), Library of Congress Prize for American Fiction (2016), and many other awards – but the scope of her practice goes much beyond that. Having spent years teaching at American universities, including 25 years as a faculty member at Iowa Writers’ Workshop, she stepped back from academic work and retired in 2016. During this year and the year before, Robinson gave an impressive number of lectures, of which this book is an honest record. In these fifteen essays, she does something impressive and consistent with her oeuvre. Her reflections upon issues as disparate as Christian forgiveness and the current political scene result in a coherent vision on the contemporary world with its tragedies, entanglements, and wonders in all their shades. The matter which is conspicuously present in Robinson’s newest book is, without a doubt, morality broadly defined. As eclectic as this word may seem, there is no denying that it finds its place in each and every essay. These are more straightforward elaborations on the moral vision offered in her fiction writings – Lila (2014), for instance, depicts the dramatic implications of living in poverty and loneliness, while Gilead (2004) seems to force readers to examine, judge, and finally forgive the novel’s characters. After all, one essential thing has not yet been said about Robinson’s worldview: she is an ardent believer in God. Theistic notions soak through the vast majority of her ethical claims. Not only is it present in the essays inseparably tied to the matters of religion – such as ‘The Divine’ or ‘Theology For This Moment’ – but also in those tackling humanist education, modern intellectual tradition, and all other issues. Writing about the latter Robinson at the same time addresses the most frequent objections to her thought, as she firmly stands in favour of incorporating the religious into the intellectual. To argue for this, she holds that ‘the universe of theism is large enough not only to admit of the great range of human emotion and imagination, pathos and grandeur, but to enhance these things, to value them even when they are never noticed or valued or, for that matter, expressed in the whole of a mortal life.’ The world of her essays appears to be the most appropriate exemplification of this point, while the moral standpoint presented there proves the preciousness of not abandoning the spiritual part of human nature. The essay ‘Considering Theological Virtues: Faith, Hope, and Love’ perfectly illustrates how she makes use of the words either overused or no longer in fashion in the public discourse. In fact, this piece is composed of three mini-essays – each considering one theological virtue – which remind us of the core of our shared humanity which stands in opposition to the contemporary belief that ‘we are creatures of our race or genes or the traumas we have suffered or the shape of our brains.’ These three virtues, with all their historical baggage, simultaneously remain coherent with their traditional meaning and gain new connotations in the light of the modern acclaim of science. And to say that Robinson is not against incorporating science into our intellectual realm does not do her justice. She is a great admirer of science with all its complexity and paradoxes. Nevertheless, she is also aware of the things we have already lost and might lose in the future if we continue putting science in the empty spot of abandoned religions. This awareness is a recurring message which effectively tries to reach us throughout the entire book. There is, however, no exaggeration in a subtle warning that reading these essays without internet access or an encyclopaedia can turn out to be an insurmountable challenge. Of course, one may decide to follow the flow of words and see where they lead. Yet this carries the risk of not being able to distil the main asset of this book – the relevance and significance of nuances. While writing about democracy – as a system of government and as a value, arguably one of the dearest to her – she is firstly a citizen and secondly an academic. These two combine everyday solicitude for our societies and attention to details before making a judgment. ‘Democracy is my aesthetics and my ethics and more or less my religion’ she heartily admits. The essay ‘Our Public Conversation’ surprisingly does not concentrate solely on the commonly lamented lack of ability to conduct a meaningful dialogue; instead, it places this problem in the context of historical developments commencing with the Dutch Revolt and the English Civil War. ‘I am fascinated by history, and I don’t know what it is’ she candidly admits in this essay. The face of history which seems to fascinate her most is the history demanding meticulous study and simultaneously filling often unnoticed holes in our modern understanding of the past. This face reveals itself gradually and usually unexpectedly. It is one of the reasons why What Are We Doing Here? is not a weekend read, but rather a book to engage with and return to after some time. In the last essay, ‘Slander’, she lets us into her private life and tells us about her relation with her mother. After many years of an uneasy relationship, they finally reached an adult friendship. ‘Then she started watching Fox News’, she writes about her mother. In this way, the figure of a mother, still truly loved, in her last days is a personification of Robinson’s greatest anxiety about the modern world. Narrow-mindedness, devotion to one extreme, resignation from reflection in the name of ‘progress’, abandoning genuine spiritual life, and the widely understood trap of populism, all remain in polar opposition to her principles and humanist common sense. The latter seem utterly important nowadays. Understood as a conclusion of the whole collection of essays, ‘Slander’ takes all Robinson’s concerns back to her home. It is easily noticeable that she is deeply worried, but a huge repository of hope is hidden in her writing.